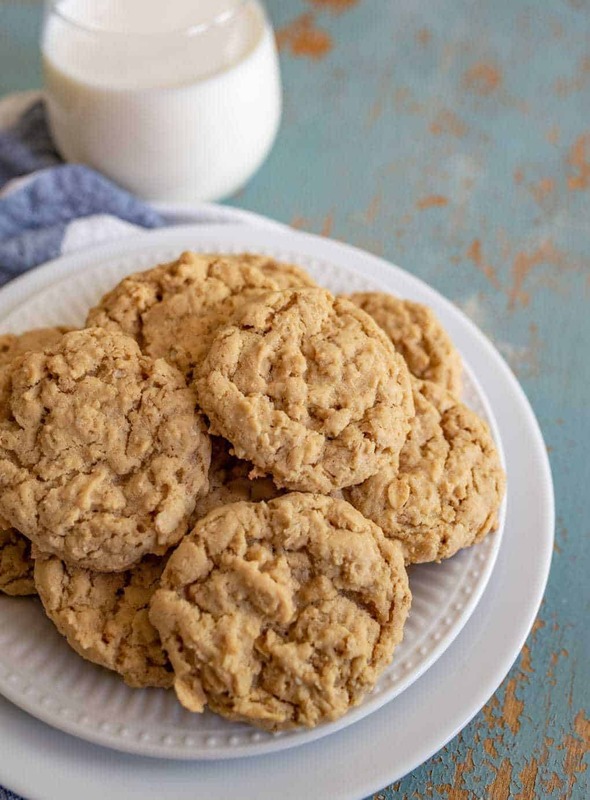 The Best Simple Oatmeal Cookie Recipe that turns out every time, no raisins, no chocolate, just simple butter and oatmeal cookies that you can add (or not add) what you like! Long live all the staple recipes that you make over and over again! I first published this recipe in 2013 and have decided it was time to update it and share it again because it’s one that I make often. It’s a classic oatmeal cookie with nothing else in it. I love that because if we want a simple plain cookie, it’s an easy go-to. If we want to mix something in, this is a great base recipe to add all kinds of things. 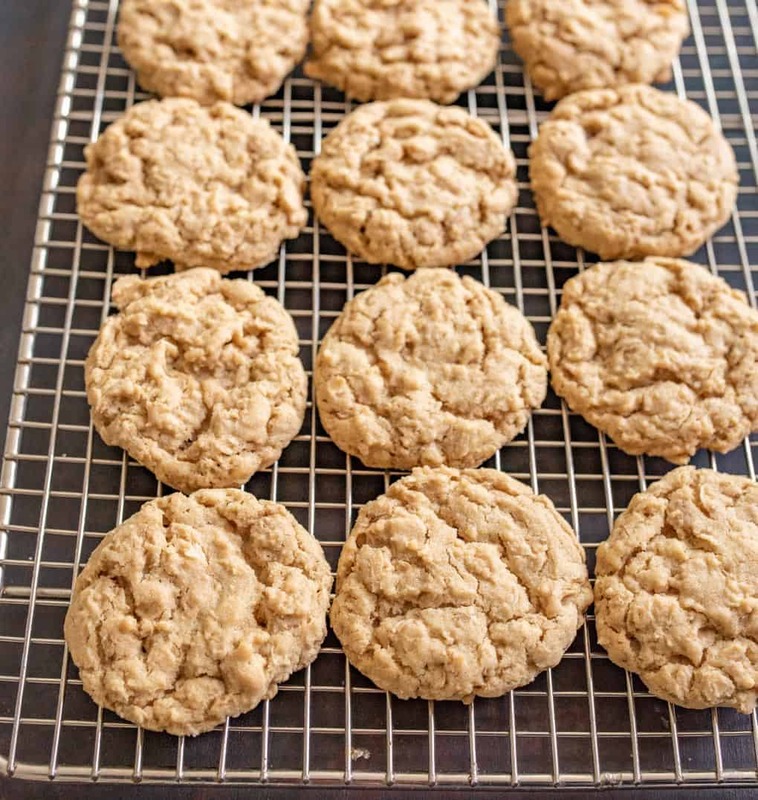 No matter what you do or do not add, this is a great solid oatmeal cookie recipe that turns out every time. These were on Husband’s favorite cookie list this year. He loves how simple and sweet they are without being over the top. And that texture is just perfect – soft and chewy with just a little bit of a crisp on the outside. Perfection I tell you, perfection. These cookies are just begging for you to add your own touches. Add between 1 and 1 1/2 cups (total) of just about anything you’d like. Try adding chocolate chips, peanut butter chips, nuts, cinnamon, cinnamon chips, chopped candy bars, M&M’s, or raisins. You could also put a layer of icing, ice cream, or peanut butter in between two baked and cooled cookies to make a sandwich cookie. The possibilities are endless! Old fashioned oats are great in this recipe because they help to make them chewy and give them that classic oatmeal texture. You can use quick cooking or instant oats (they are the same thing as old fashioned, just cut into smaller pieces), though it’ll change the texture a bit. I recommend the old fashioned oats. If you like a simple spiced oatmeal cookie, try adding 2 teaspoons of cinnamon and a 1/4 teaspoon of cloves and nutmeg. So good while keeping them simple. I always bake these on parchment paper or baking mats. Do you have baking mats yet? Such a great investment. Can you freeze oatmeal cookies or cookie dough? Yes! You can can freeze baked cookies by making the batter, baking the cookies, letting them cool completely, and then storing them in an air-tight container. They’ll be good in the freezer for up to two months. Just pull the cookies out about an hour before serving so that they have time to come to room temperature. 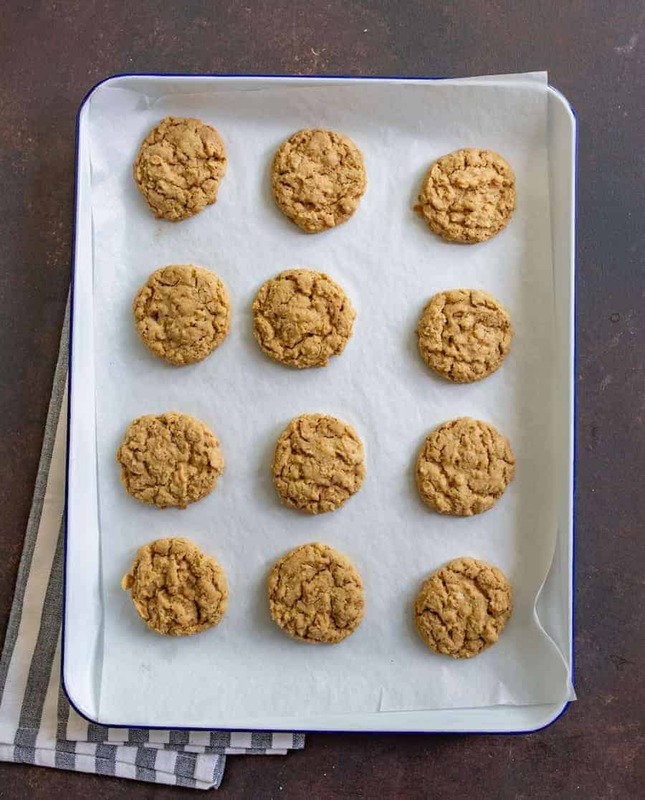 To freeze the oatmeal cookie dough, make the dough into balls and then let them freeze for a few hours on the cookie tray (or in a dish so that they aren’t touching much). After the cookie dough balls have frozen through, add them to an air-tight container or a freezer zipper-top baggie. When you are ready to bake the dough, simply preheat your oven, place the frozen cookie dough balls on a baking sheet like you would fresh dough, and bake, adding 2-4 minutes to the suggested cook time, as needed. No need to thaw ahead of time. 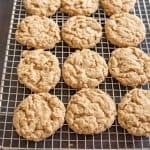 The Best Simple Oatmeal Cookie that turns out every time, no raisins, no chocolate, just simple cookies that you can add (or not) what you like! Add the butter and the brown sugar to the bowl of your stand mixer and beat on medium speed until the mixture is light and fluffy, around 5 minutes. Add the flour, sprinkle in the baking soda, baking powder, and salt. Mix until combined. Add the oats and combine. Fold in the dried cherries, chocolate, chopped pecans, or other mix-ins if desired. The mixture will be a little tacky, but you should be able to roll it into a ball in your hands without making a total mess. If it is too sticky, add 1 tablespoon of flour at a time until the mixture can be handled. Roll the dough into 1 to 1.5 inch balls (about 1 large tablespoon of dough), using your hands and place the balls on the prepared cookie sheet 2 inches apart. Bake for 10 to 14 minutes until the edges begin to brown and the centers are set. This is a recipe that we love to make and share often. I’m so happy to have it updated and shared with you because you are going to love it. Enjoy from my kitchen to yours. This post was originally published in April 2013 and has been updated, rephotographed, and improved with reader feedback. I made these today and oh wow! Great texture and flavor in every bite. I added toasted coconut and walnuts. Definitely a cookie I’ll make often and try different additions. We loved these! Crunchy but chewy, and full of rich flavor (thank you butter!) No additions… that would be too scary for my other half…. one step at a time! A perk of being snowed in this week has been playing with your recipes! He likes these so much, he is willing to let me do an add-in on round 3……oh my!!! First though, we will need to consume round 2…..life is rough! Tonight he read the oatmeal container while I was mixing a batch, and proudly announced….”It says here oatmeal will lower my cholesterol, so these cookies will be healthy for me!!!!!!!!! !” Bah ha ha!!! Copied wholesale from Jools Oliver, Jamie Olivers wife. Thse have been around for years. At least credit who you are copying. Hey now, let’s not point finger where fingers don’t need to be pointed. I certainly didn’t steal anyone’s recipe, and certainly not Jamie Oliver’s wife’s. I had to look hers up and it’s not at all like mine. And I published this recipe for the first time in 2013, so it’s been around a long time. I always give credit if the recipe is not original to me. I believe in internet Karma, maybe you should start believing in it too. He loves these cookies! I need to surprise him with a batch one of these nights. I think baking mats are such a great invention! Cookie dough is dangerous to have around…either fresh or frozen….its one of life’s tasty pleasures!! That sounds awesome. Did you replace anything with the bananas or just add them in addition to everything else? Definitely something I want to try! Just finished makeing these cookies. They are delicious. I added walnuts and they taste amazing! One of my favorite additions! Did you add a little cinnamon to go with your walnuts? That’s so good too, just a 1/2 teaspoon! I would like to know how to use this recipe with grams instead of cups. Sorry you didn’t find success. The recipe indicated that you need to use parchment paper on your pan which stops the cookies from sticking. Alternatives to parchment is to grease the cookie sheet or to use baking mats, all of which will fix the issues. I’ve used both with great success and don’t think it makes a huge difference either way for this recipe. Unsalted is more traditional for baking though. is it true that it’s only 19 calories per portion? and what do you consider a portion? That’s what the calorie counter that I use says. Feel free to plug it into something like MyFitnessPal once you know how many cookies your batch made and see what you get. I just made half a batch of these, adding a few crumbled wafer praline “cigars” In there and subbing applesauce for half the butter to make up for the wafers. They are delicious! You saved the next few days’ breakfast. I can’t wait for my preschooler and husband to try these tomorrow. Will definitely be making them again as well, with different, and healthier, add-ins. I love versatile recipes so much! Ooohhh fun idea! I have an applesauce cookie on my site that you might love too! Yes, I am an applesauce newbie and I love it! I have been making it for my 8-month-old’s meals but there are so many recipes to make with it, plus you can sub it for butter. Plus, you can just eat some straight out of the jar when the need for dessert hits! Oh, and the cookies only lasted 2 days. 20 of them. HUGE hit over here. Did I do something wrong my cookies came out in the flatter side?! It’s probably just a measuring thing or your butter was a little on the warm side. So melty butter that isn’t creamed into the sugar long enough and/or not enough flour will lend to a flatter cookie. You could also try chilling the dough before baking. Let me know how it turns out, I hope they tasted great!